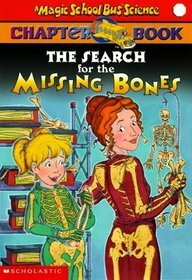 For most of the week, we've been reading slowly through The Magic School Bus, The Search for the Missing Bones. It's a beginning chapter book, that could normally be read in one sitting, especially by older children, but we've stretched it out, by reading it as a family, and working through accompanying activities, like drawing our own hand "x-rays", with chalk, on black construction paper, as a follow-up to our bones of the hand cookies. ...and ball and socket joints, by taping paper tube "bones" to ping pong balls, to fit into sockets, or our case, halved rubber balls, and cup shaped plastic molds. We even learned about synovial fluid, by applying a coating of cooking oil to the socket, so the ball could move more freely within the "joint". The supplies, and ideas for these activities came from two pre-packaged kits, The Young Scientists Club Kit 19, Bones and Muscles, and The Magic School Bus: Journey Into The Human Body - which coincidentally, is also put out by The Young Scientists Club. In fact, I didn't realize until I had ordered, and opened the Magic School Bus kit, that it is just a copy of the a couple of The Young Scientists Club kits, but with a Magic School Bus theme, a lot of distracting business, and a higher price tag. I've sung the praises of The Young Scientists Club kits before, click here to read all about it. Working through one of our old kits, this week, with my younger three children (ages 4-8), I remembered why I like them so well. They are really well put together, and nicely supplied, kits, with good parent/teacher instructions, and scientific notebook-style pages for the children to work through, encouraging reading, and writing, as well as science skills. As much as we love The Magic School Bus series, I found the plain old Young Scientists Club kit, was superior, and a better match to The Magic School Bus chapter book, than The Magic School Bus themed kit. Since the original kits cost less, even in a three kit pack from Amazon, we'll steer clear of the theme versions in the future. The Young Scientist Club Kit #19, Bones and Muscles? Yes. It's probably best for ages 6-10, but we found something for the entire family to learn, and enjoy, this time around. The Young Scientist Club's The Magic School Bus: Journey Into The Human Body? Probably not. It's not that well stocked, not all the experiments are original, or interesting, and the accompanying booklet is even busier than The Magic School Bus picture books. The Magic School Bus chapter books, and animated television episodes? Always winners in our house, even if The Search for the Missing Bones does have a Halloween theme, which we usually avoid. Read in the summer, it's not nearly as bothersome, or creepy. And, as usual for The Magic School Bus series, it is packed with facts. Find out what other families are reading this week at the What My Child Is Reading link-up hosted by Mouse Grows, Mouse Learns. Or, for more fun with science for children, be sure to check out the Science Sunday link-up, over at Adventures in Mommydom. Thanks for the review! It is always nice to find a reasonably priced kit that's well put together. I like it because it has all the items and information in one kit. But not all kits are worth it. I wish our daughter liked the Magic School Bus but she had a bad experience with one of the videos which scared her (space) and won't go near them! I'll have to wait until she grows out of them. Recently, we used a dinosaur kit which is taking a while to dig through. We like it so far especially since my husband was able to turn the information provided into a quiz for fun. That ball and socket joint activity looks perfect. My husband's father is having hip surgery in a few months so maybe we'll have to look into an activity like this to explain what is going on. I agree with you assessment of the MSB kits and the MSB series. Never used the YSC kits. You know I think my kids might finally be ready for Magic School Bus. I love all of these activities! I just collected a few of the magic school house chapter books for our school this year...looking fwd to reading them. We will also be studying the human body this year, you are always one step ahead of us it seems, but I love that since you have such great ideas!! I keep adding more and more bookmarks to all your great advice, and suggestions. I know they will come in handy down the road. Thank you for all that you share. I'll have to check out a Young Scientist kit sometime. I think we have a MSB kit somewhere that we have yet to open. I just found your website today, and what a wealth of information it is. I am just wondering how you choose what books to read each week. Marcie - I try to bring in books from the library, that go along with things we're doing, or seeing in movies, or just happen to be interested in that week. Luckily, our library system can bring books in from all over the state very quickly.